“Hey, this soap is making my skin dry. 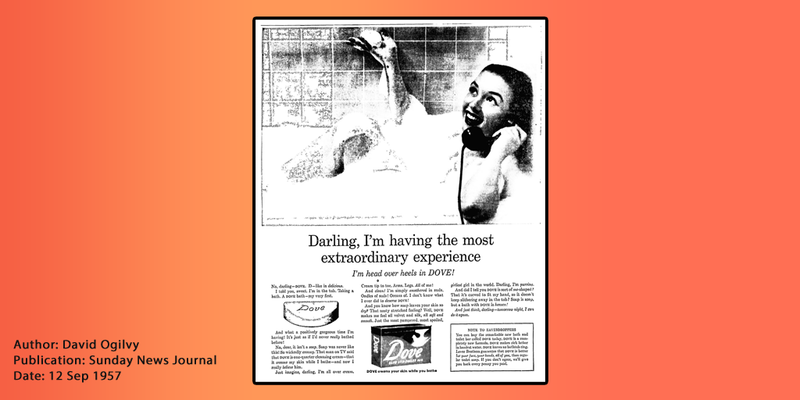 Do you know any soaps that don’t?”, I asked my wife while reading Ogilvy on Advertising. “Dove, I think”, she replied. The success of this Dove ad is widely celebrated, but there’s another interesting branding case study that’s never been looked into before. Further down the page, Ogilvy makes a claim that’s easy to miss if you’re not pouring over the book like a madman in the early hours of the morning. Now, it’s not like Ogilvy doesn’t spend a massive amount of time on research (he took 3 weeks writing the copy for his famous electric clock ad), but what makes the Saab a better car for winter than any other? The answer: The same reason Dove is soap for dry skin. 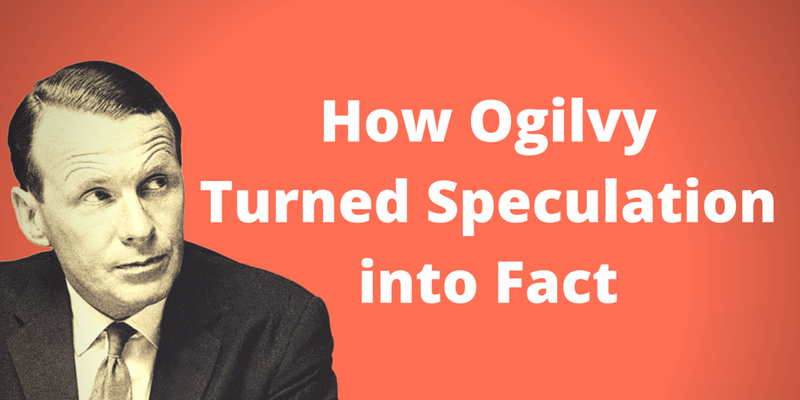 Because Ogilvy said so. He was tasked with selling a product and that’s exactly what he did. Note: No one has written this branding case study before so it was tricky to get ahold of these images. To find most of them I had to check through Google’s newspaper archive — if you’re looking for old ads, that’s where you’ll have the most success. 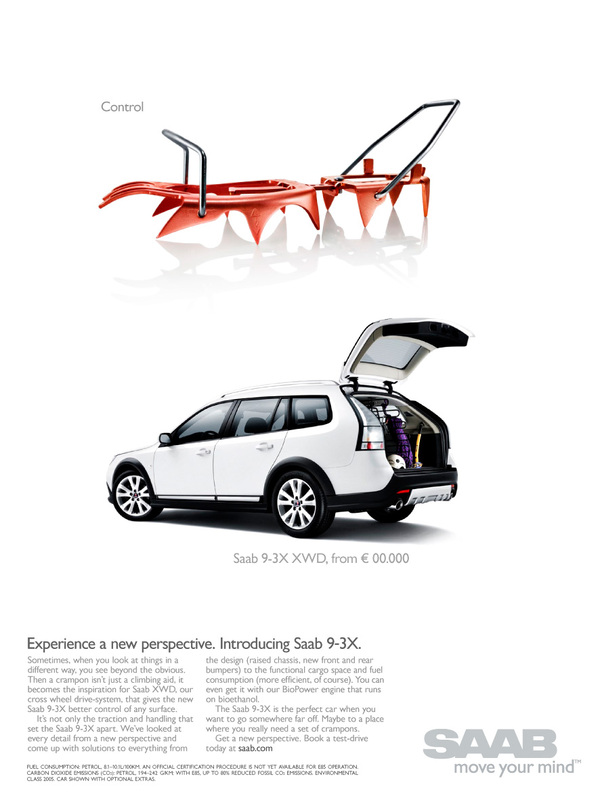 Ogilvy highlighted the Saab’s features as suited for winter (probably because it’s made in snowy Sweden) as a way to position it as a reliable car. The fact that just 3 years later it was voted best car for Norwegian winters shows he turned speculation into reality. 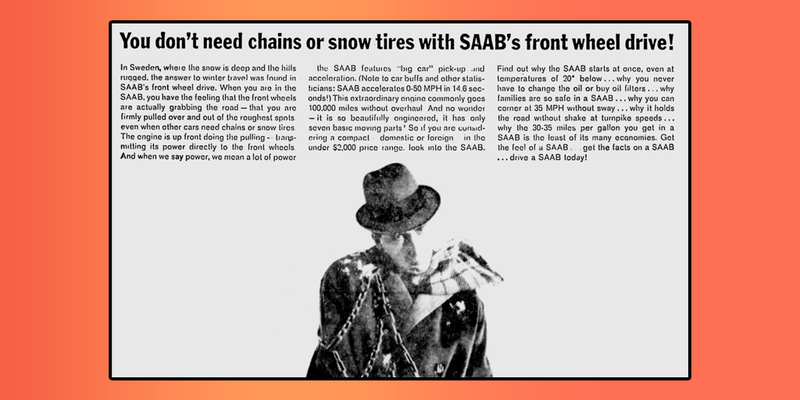 Almost every line in this ad is geared towards drilling in the idea that Saab makes winter cars. 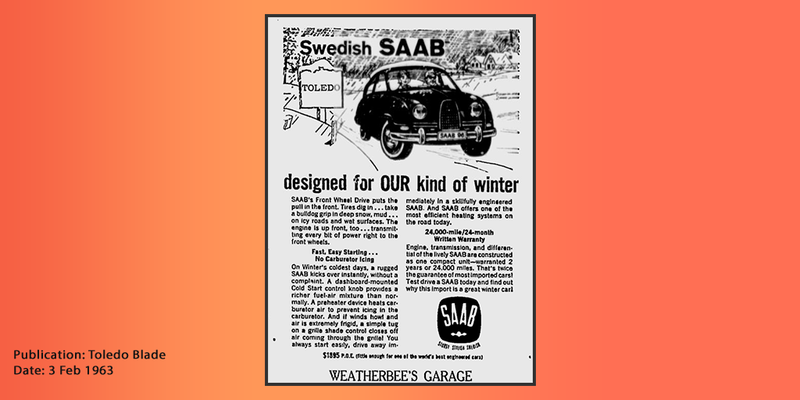 It’s interesting to note how Saab conformed with Ogilvy’s winter car positioning: the 1961 Saab didn’t have the ‘dashboard-mounted Cold Start control knob’, but 2 years later it’s fitted in the next model. 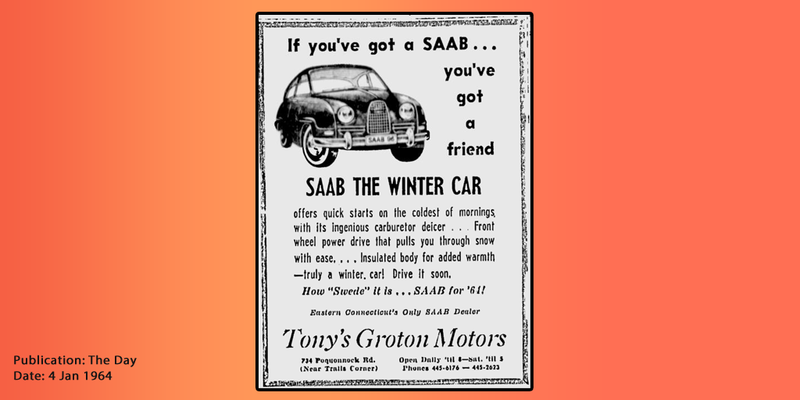 This is obviously not one of Ogilvy’s, but the idea that Saab was a winter car is being perpetuated by others, as shown in this ad by a local Connecticut dealership. 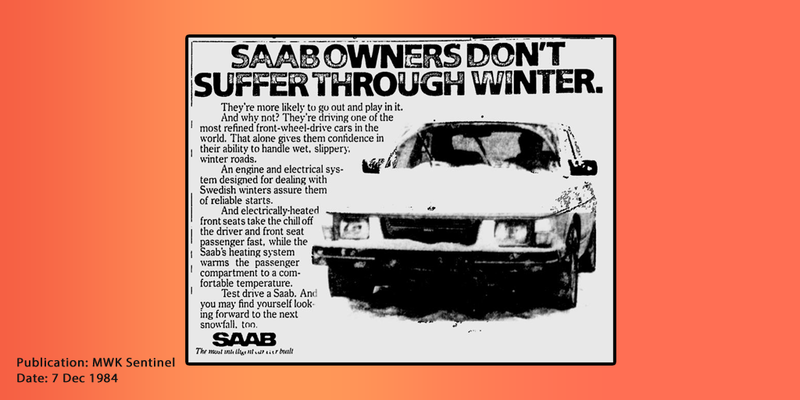 Nine years later and advertisers are still running with the winter car theme for the Saab 99E. 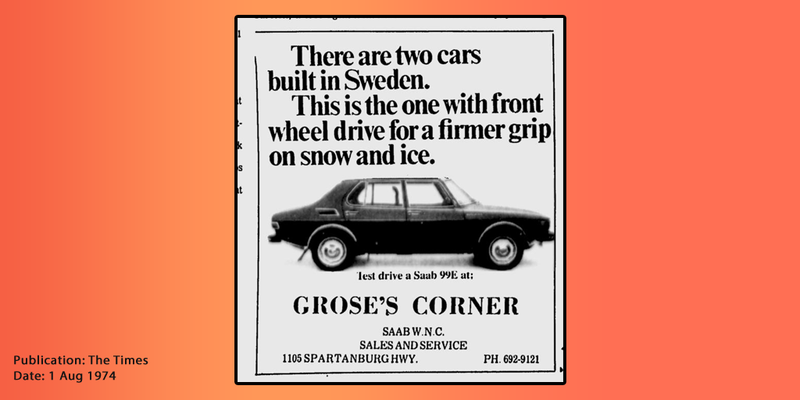 Throughout the ’70s and ’80s, adverts often referenced Saab’s superiority to Volvo, the ‘other’ Swedish car. The copy on this ad is remarkably similar to Ogilvy’s original, 17 years earlier. 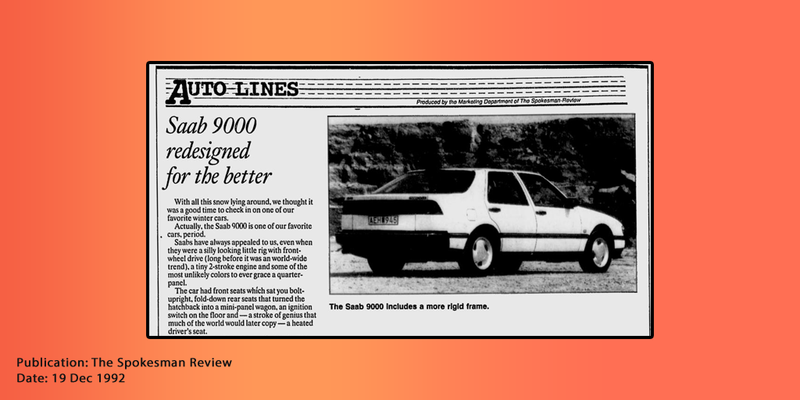 Saab’s ad campaigns didn’t evolve much since that first ad. As we’ll soon see, they’re still making references to the ‘winter car’ ads in recent campaigns. Here’s an example of native advertising before it became popular because no one read obvious ads on the internet anymore. Check above the headline and you’ll see it was produced by the newspaper’s marketing department. What’s interesting is that all the other articles on the page try to sell you the idea of winter safety on the road, with headlines like “How you drive more safely on ice” and “Cold weather toughest time for cars, so prepare now”. This ad is firmly for snow-frustrated American audiences, with references to American poet Robert Frost’s The Road Less Travelled and the American-only end line, “Welcome to the State of Independence”. Since Saab failed, how successful was Ogilvy’s ad? It’s not Ogilvy’s fault that Saab failed, especially 51 years after his only Saab advert. If anything, as we’ve seen from the insane lifespan the ‘winter car’ claim, if it wasn’t for Ogilvy Saab could have failed far earlier. In fact, Saab’s positioning as a quirky car has done it wonders. Even though modern Saab is failing, the Financial Times (in an article unfortunately behind a paywall) reported “Saab drivers have the highest level of psychological involvement with their cars, being over 10 times more passionate than the average Volkswagen driver”. Interesting branding study. It is sad that SAAB didn’t continue on this track.